Martin was looking to replace a tired and crumbling concrete outbuilding with a 2 x bay garage with upstairs storage space. 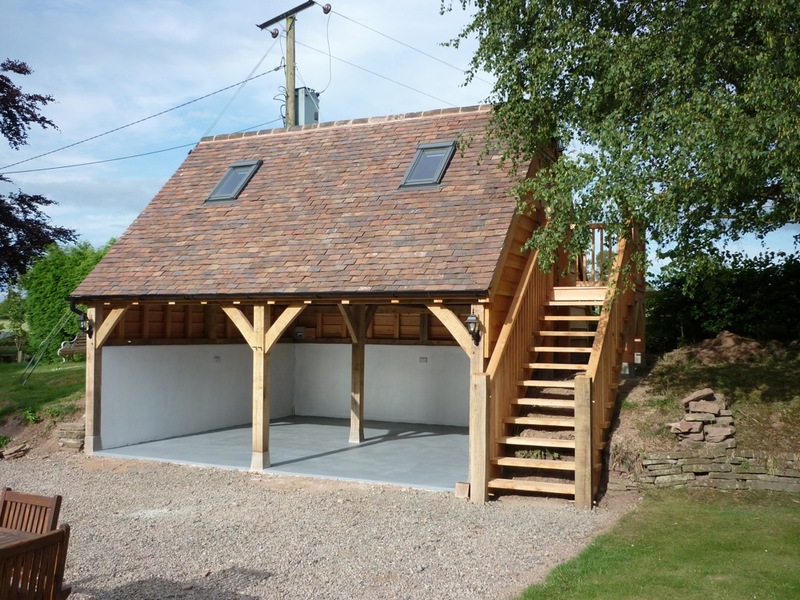 Rather than going for one of the many oak framed garage kits, the constraints of the site (it needed to be set into a bank with a retaining wall) meant that a more bespoke solution was needed. Having seen at first hand Rob and his team erect a full oak frame in a day for one of his neighbours, Martin approached Castle Ring Oak Frame for a chat about ideas and costings. A hybrid design was agreed on, using green oak for the exposed primary elements of the structure, and douglas fir for the roof trusses, purlins and rafters. Rob coordinated all elements of the project using a local builder contact to provide the footings and tanked blockwork retaining wall, ready to receive the frame. Once the frame was up, the garage was roofed with reclaimed clay tiles, douglas fir weatherboarding, and finished off with a rustic douglas fir staircase.